WASHINGTON – The U.S. Marshals and the State of Hawaii are seeking the public’s help in locating Luke J. Warner, one of Hawaii’s Top 15 most wanted fugitives. Warner, 48, is wanted for skipping out on a 10-year federal prison sentence for meth trafficking. He is also facing a prison sentence from the state. Authorities believe Warner may have fled Hawaii, and has ties in California, Florida, Massachusetts, and Iowa, but his whereabouts are currently unknown. He has an extensive criminal history to include armed robbery, theft, weapon and drug possession, and should be considered armed and dangerous. Warner, who also uses the alias Louis Manetti, is a 5-foot-7 white male weighing 170 pounds with graying hair, light brown eyes and a small facial divot on his left cheek. His interests include dealing in precious metals, and going to jewelry shows and swap meets. 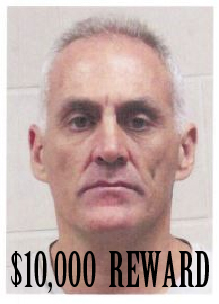 A reward of up to $10,000 is being offered for information leading directly to Warner’s arrest. Anyone with information is urged to submit a tip on this website. Note, to be considered for the reward you must include your contact information. For additional information about this case, go to http://www.usmarshals.gov.